Progress End Links are recommended for use on all of the Progress anti-sway bars. The Rear bar for the WRX STI is a 22mm solid steel bar and under extreme driving conditions you will often find that the OEM end-links are the weakest link in the system. 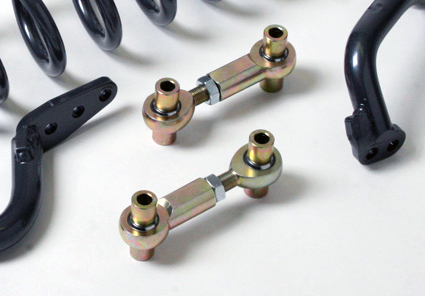 These are a great upgrade to give you many trouble free miles on the track or the street when combined with a Progress sway bar. Established in 1995, The PROGRESS Group Inc. has evolved from modest beginnings as a distributor of suspension components to the manufacturer of the nationally recognized PROGRESS Technology line of performance handling components. After ten years of continuous development, The PROGRESS Technology line of suspension components has become a premier program for tuning today's popular automobiles. Our long-term commitment to superior products and unparalleled customer satisfaction are fundamental to our business today. "Advancing the Art" is the slogan adopted by the founders of the company in their quest of becoming the leaders in today's highly competitive suspension aftermarket.